Kakadu, Nitmiluk Gorge, Litchfield & Beyond!The Ultimate Top End Expedition! Explore Kakadu, Nitmiluk & Litchfield National Parks in depth as you immerse yourself in Indigenous culture, spectacular & refreshing waterfalls and view an array of wildlife & mesmerising scenery. For Groups of 4 or more Adults, a 5% discount will be applied manually prior to final payment. The Family rates shown already include the 5% discount. Child Age is 8 to 15. 16 & over is classed as an Adult. For legal reasons we can only carry children under 8 on private charters as a booster seat is required. This year commemorates the 32nd anniversary of one of Australia's most important Indigenous festivals - Barunga. Join us for SIX days of cultural immersion as we head down to the festival before exploring the rest of the Top End. Make your long weekend a week long cultural immersion and Top End exploration! community as they reunite with family members and countrymen from all over the Top End, and welcome tourists from far and near to experience contemporary community life for the weekend. Join in activities at the Festival before exploring Kakadu, Nitmiluk & Litchfield National Parks in depth as you immerse yourself in Indigenous culture, spectacular & refreshing waterfalls and view an array of wildlife & mesmerising scenery. Depart Darwin @ 7.00am and make our way towards Katherine. A brief stop at Adelaide River maybe for some breakfast and continue on to Edith Falls for a swim and lunch. Travel on through Katherine and arrive at Barunga (45 min south of Katherine.) mid-afternoon to set up camp in the community camp-ground. Get involved in some of the activities and relax in the evening listening to the Indigenous bands at the Skinnyfish stage or other featured artists down at the riverside APRA tent. A whole day to partake in all the different activities available. These include: Damper Cooking, Yidaki (didgeridoo) Making and Demonstration, Weaving Workshops, Bush Tucker, Spear Throwing Competition, Kriol Language Classes & Women’s Story Telling. Spend the evening listening to some fabulous music at either the Skinnyfish stage or the APRA riverside tent. 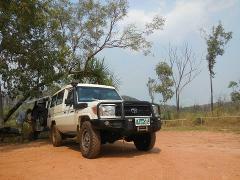 Pack up camp early and make our way back through Katherine, detouring out to Nitmiluk Gorge for a 2 Hr cruise. Departing the Katherine region, we head back north to Pine Creek and on to Kakadu. This afternoon we visit one our favourite waterfalls, Gunlom Overnight camp here with time to explore, relax and swim. We head northwards through the Park to our next favourite waterfall - Maguk(Barramundi Gorge). Nestled amongst the sandstone escarpment at the end of a paper-bark lined creek. The rock pools above and the plunge pool below the falls provide a refreshing swim option. Call in at the Warradjan Cultural Centre before watching a magical sunset on a Yellow Waters Cruise before heading to our overnight camping area. This morning we head to the northern region of Kakadu for another day of cultural immersion. Join the Guluyambi Cultural cruise on the East Alligator River to gain an amazing insight into local customs and dreamtime stories from the local Indigenous guide. We may even see a few Crocodiles! View ancient Aboriginal rock art at Ubirr and take in the spectacular scenery as we climb atop the rocky outcrop for majestic views of the Arnhemland sandstone plateau. Travel towards Darwin on the Arnhem Highway, calling in at The Bark Hut Inn for a break before taking a 4WD detour across to our overnight accommodation near Litchfield. A Short drive to Litchfield National Park this morning so we beat the crowds and explore, relax and swim in some fantastic easily accessible waterfalls. A fantastic way to finish off our Top End expedition. We return you to your Darwin accommodation around 5pm so you can check in and get down to the Mindil Beach sunset Markets. Artists will be announced early 2017. All Camping Equipment (Twin share Dome tent, 50 mm foam mattress). Barunga is a DRY community - No alcohol is to be carried into Festival. Police will be inspecting vehicles on entry. Offered only as a STANDBY departure as part of our 6 Day Top End Expedition. Limited Departures between May to September so book early to avoid missing out! Day 1 - 7:00am pick up from your Darwin accommodation. Time for a spot of real 4 Wheel driving today as we travel to Jim Jim and Twin Falls. After crossing the Jim Jim creek, we arrive at Twin Falls and cruise through the gorge, admiring the towering escarpment from the sandy beach. Arriving at Jim Jim Falls, walk through the monsoon forest and enjoy an invigorating swim in the plunge pool. Late afternoon we make our way back to our camp-site. This morning we visit Burrunguy (Nourlangie Rock) to view more ancient rock art before making our way to the southern region of the Park. Visit one our favourite waterfalls, Maguk (Barramundi Gorge). Nestled amongst the sandstone escarpment at the end of a paperbark lined creek. The rock pools above and the plunge pool below the falls provide a refreshing swim option. Arriving at Gunlom we set up camp and enjoy a refreshing swim in the Gunlom plunge pool A quick scramble back down the ridge before it gets too dark and enjoy another hearty meal. After breaking camp, hike to the top of the falls for a swim in the renowned ‘Infinity’ pool and spectacular scenic views. 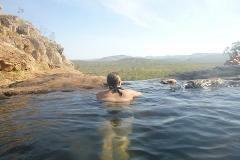 Enjoy another refreshing swim in the Gunlom plunge pool before setting off towards Katherine. Exiting Kakadu from the south we call in at the old gold mining town of Pine Creek and take in some of its history. At Pine Creek you will transfer to the Greyhound Coach for your return to Darwin. Arrive back in Darwin at the Darwin Public Bus terminal at 5.20pm. You will have to make your own way back to Accommodation.